The Manhattan Institute’s Proxy Monitor database, launched in 2011, is the first publicly available database cataloging shareholder proposals and Dodd-Frank-mandated executive-compensation advisory votes at America’s largest publicly traded companies. The database is overseen by Margaret M. O’Keefe, who has more than two decades’ experience in executive-compensation, corporate-governance, and proxy-advisory consulting. This is the 37th publication in a series of findings and reports written solely or jointly by Manhattan Institute legal-policy director James R. Copland, each drawing upon information in the database to examine shareholder activism in which investors attempt to influence corporate management through the shareholder-proposal process. As June draws to a close, so does corporate America’s proxy season, when most large publicly traded companies hold annual meetings. At these meetings, corporate shareholders cast votes on ballot items—typically by proxy—considering questions placed on ballots distributed under rules promulgated by the Securities and Exchange Commission (SEC). Among the ballot items under consideration are proposals introduced by shareholders themselves, which may be submitted—subject to substantive and procedural rules—by any owner of equity securities, provided that the equity holder’s shares are valued at $2,000 or more and have been held for at least one year. Shareholder proposals typically involve corporate governance (procedural questions involving board structure or shareholder voting rights), executive compensation, or social-policy issues. 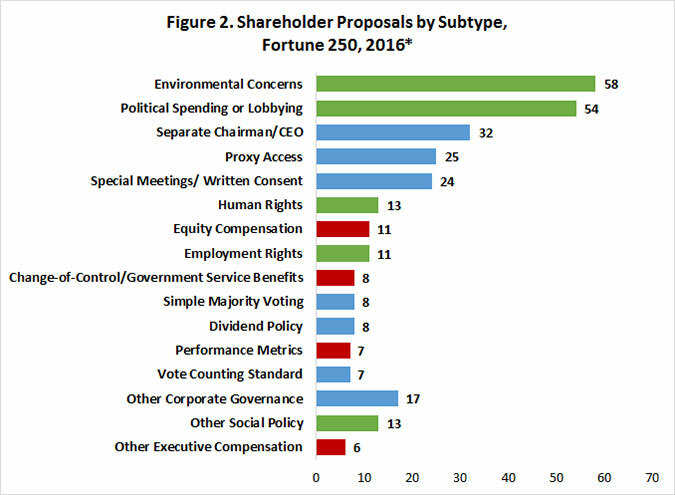 In 2016, almost half of all shareholder proposals involved social-policy issues (Figure 1), and the most introduced types concerned the environment or issues related to companies’ political spending or lobbying (Figure 2). 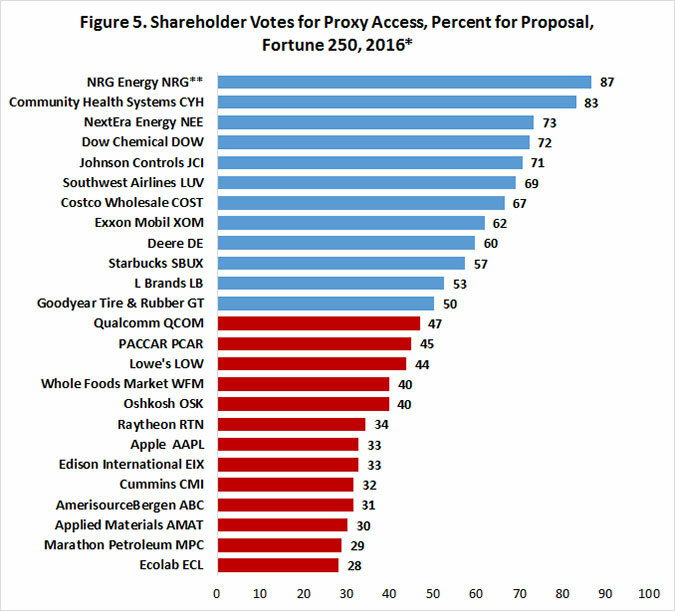 As in 2015, however, the proposals most likely to garner majority shareholder support in 2016 involved “proxy access,” the idea that shareholders should have the right to place their own nominees for director on corporate proxy ballots to compete with boards’ own director nominees (Figure 3). This finding explores the recent push for proxy access by certain shareholders and examines the 2016 proxy-access proposals and voting results in more detail. but failed because it was presented as an amendment to the company’s certificate of incorporation, requiring unanimous support. In August 2010, the SEC released Rule 14a-11, which would have mandated that publicly traded companies list shareholders’ nominees for director on their corporate proxy ballots, as long as the nominating shareholder had held at least 3 percent of a company’s stock for a minimum of three years. Companies were not required to list a number of nominees totaling more than 25 percent of their board. The 2015 proxy season saw the first concerted push to utilize the amended Rule 14a-8. In November 2014, the office of New York City comptroller Scott Stringer—an elected official who oversees the pension-fund assets that underlie retirement benefits for the city’s employees—announced a new “Boardroom Accountability Project” purportedly designed “to ensure that companies are truly managed for the long-term.” Proxy access was to be the initial focus of the project. In 2015, the New York City pension funds introduced shareholder proposals seeking proxy access—with rules paralleling the SEC’s voided Rule 14a-11—at 75 companies, 39 of which are among the 250 companies in the Proxy Monitor database. In its initial year, Comptroller Stringer’s program met with significant success, in terms of currying shareholder support. Eighteen of New York City’s 22 shareholder proposals seeking proxy access at Fortune 250 companies received majority shareholder support in 2015, as did two-thirds of all such shareholder proposals, compared with 3.5 percent of all other shareholder proposals. By the end of 2015, 109 companies had adopted proxy-access rules, according to the comptroller’s office. Fewer shareholder proposals seeking proxy access were on 2016 proxy ballots than in 2015—25 to date versus 39 in all of 2015. This is not because the New York City pension funds reduced their focus on the issue. In January 2016, the comptroller’s office announced that it had introduced or would be introducing shareholder proposals at 72 companies, only three fewer than in 2015. These included 36 proposals at companies that it had targeted the previous year that had not yet adopted proxy-access rules satisfactory to the comptroller’s office and 36 newly identified companies. 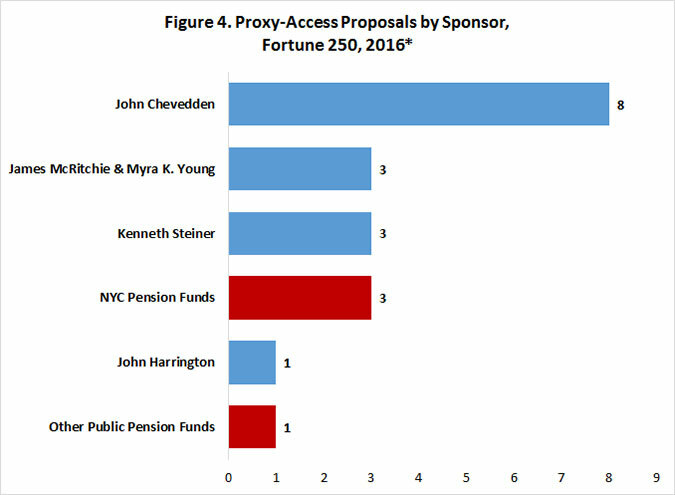 Although the New York City pension funds sponsored almost as many proxy-access proposals in 2016, only three of their proposals were on proxy ballots among the 228 of the 250 largest publicly traded companies with annual meetings scheduled through the end of June (Figure 4). Many more companies appear to have negotiated with the funds—adopting their own proxy-access rules—probably owing to the 2015 shareholder response. The New York City pension funds have withdrawn proxy-access proposals at 50 of the 72 companies to which they submitted them, according to their own reported figures. In the wake of the New York City funds’ 2015 success with proxy access, however, there has been a spate of proxy-access proposals introduced this year by “corporate gadflies,” individual investors who repeatedly submit multiple common shareholder proposals at many different companies. Gadfly investor John Chevedden, who has sponsored more shareholder proposals than any other investor across the 11-year history of the Proxy Monitor database, sponsored eight of 25 proxy-access shareholder proposals that have made Fortune 250 companies’ proxy ballots to date in 2016. Chevedden had never sponsored a proxy-access proposal at any Fortune 250 company prior to 2016, dating back to 2006 (the first year covered in the Proxy Monitor database), suggesting that his enthusiasm for the issue in 2016 may be a result of the ballot item’s success last year. Overall, corporate gadflies have sponsored 79 percent of all proposals to make ballots this year, although that percentage is greatly inflated because New York City–backed proposals have generally been negotiated off ballots by companies that adopted their own proxy-access rules. Twelve of 25 proxy-access proposals presented at 2016 annual meetings of Fortune 250 companies through June 10 received majority shareholder support. The average shareholder support for a proxy-access proposal in 2016 has been 50.7 percent (Figure 5). **Shareholder proposal was not opposed by board of directors. Although the percentage of companies receiving majority shareholder support for proxy-access shareholder proposals fell year-over-year, the large number of companies that negotiated with the New York City funds not to introduce a proposal—introducing their own proxy-access rule—skews the voting totals. Moreover, 12 of the 13 companies at which a majority of shareholders failed to support the proposal introduced their own proxy-access rule, either adopted by the board or as a competing proposal on the ballot. These alternative rules typically specified that no more than 20 shareholders could aggregate their shares to reach the 3 percent proxy-access ownership threshold—a requirement not typically included on corporate gadflies’ proposals. In addition, 11 of the 12 alternative proxy-access rules allowed shareholders to nominate only 20 percent of outstanding board seats, as opposed to 25 percent in the shareholder proposal and former SEC Rule 14a-11. One of the companies, Oshkosh, adopted a higher ownership threshold for proxy access (5 percent, versus 3 percent). The only company to defeat a proxy-access shareholder proposal without adopting its own proxy-access rule was PACCAR (a truck manufacturer), which faced a proposal from the New York City pension funds for the second straight year. PACCAR’s board did adopt a new rule placing its entire board of directors up for election annually; it had previously held staggered board elections. The percentage of shareholders supporting New York City’s proxy-access proposal at PACCAR increased slightly from 2015, rising to 44 percent from 42 percent a year ago. After 2015, when a majority of shareholders at two-thirds of companies supported proxy-access shareholder proposals, most companies appear to have decided to adopt a proxy-access rule rather than fight it. Companies clearly have some latitude about how to structure such a rule if they communicate with their shareholders; in general, companies that would prefer proxy access for no more than 20 percent of board seats appear likely to win shareholder support. In some cases, companies may be able to push that limit lower—or the ownership threshold higher. Finally, shareholders appear willing to embrace a limit on the number of shareholders who can combine their ownership interests to nominate directors. What remains to be seen is whether the D.C. Circuit’s worries in Business Roundtable are well-founded. Will “investors with a special interest, such as unions and state and local governments whose interests in jobs may well be greater than their interest in share value” in fact utilize proxy-access rules to “pursue self-interested objectives rather than the goal of maximizing shareholder value”? That the New York City pension funds’ screening criteria include issues with a public-policy valence but an attenuated connection, at best, to share value—“board diversity” and “climate change”—should give most shareholders pause. See Reports and Findings, http://www.proxymonitor.org/Forms/reports_findings.aspx (last visited Mar. 30, 2016). 2016 results include 228 of 250 companies to have scheduled annual meetings by the end of June. Sixteen additional companies from earlier years’ Fortune 250 lists, no longer among the 250 largest publicly traded companies, have proxy information listed on the ProxyMonitor.org database but are excluded from this analysis. 2016 voting results include 219 of 250 companies to have held annual meetings by June 10. In determining shareholder support for shareholder proposals, the Manhattan Institute counts votes consistent with the practice dictated in a company’s bylaws, consistent with state law. Some companies measure shareholder support by dividing the number of votes for a proposal by the total number of shares present and voting, ignoring abstentions. Other companies measure shareholder support by dividing the number of favorable votes by the number of shares present and entitled to vote—thus including abstentions in the denominator of the tally. Neither practice necessarily skews shareholder votes in management’s favor: whereas the latter method makes it relatively more difficult for shareholder resolutions to obtain majority support, it also makes it more difficult for management to win shareholder backing for its own proposals, such as equity-compensation plans. Shareholder-proposal activists prefer to exclude abstentions consistently in tabulating vote totals, without regard to corporate bylaws; see Heidi Welsh, Accuracy in Proxy Monitoring, HLS Forum on Corporate Governance and Financial Regulation (Sept. 16, 2013), https://corpgov.law.harvard.edu/2013/09/16/accuracy-in-proxy-monitoring-2 (critiquing the Proxy Monitor data set), which necessarily inflates apparent support for their proposals. But such a methodology is inconsistent with federal law. The SEC’s Schedule 14A specifies that for “each matter which is to be submitted to a vote of security holders,” corporate proxy statements must “[d]isclose the method by which votes will be counted, including the treatment and effect of abstentions and broker non-votes under applicable state law as well as registrant charter and bylaw provisions”—clearly indicating that corporations can adopt varying counting methodologies in assessing shareholder votes and that state substantive law governs the parameters of vote calculation. See Item 21, Voting Procedures, 17 C.F.R. § 240.14a-101, available at https://www.law.cornell.edu/cfr/text/17/240.14a-101. Under the state law of Delaware, where most large public corporations are chartered, “the certificate of incorporation or bylaws of any corporation authorized to issue stock may specify the number of shares and/or the amount of other securities having voting power the holders of which shall be present or represented by proxy at any meeting in order to constitute a quorum for, and the votes that shall be necessary for, the transaction of any business.” Del. Gen. Corp. L. § 216, available at http://delcode.delaware.gov/title8/c001/sc07 (last visited Sept. 11, 2015). As a default rule, absent a bylaw specification, Delaware law specifies that “in all matters other than the election of directors,” companies should count “the affirmative vote of the majority of shares of such class or series or classes or series present in person or represented by proxy at the meeting,” id. at 216(4)—the precise inverse of shareholder-proposal activists’ preferred counting rule. The SEC staff has adopted a permissive standard that “[o]nly votes for and against a proposal are included in the calculation of the shareholder vote of that proposal,” ignoring abstentions, SEC Staff Legal Bulletin No. 14, F.4., July 13, 2001, https://www.sec.gov/interps/legal/cfslb14.htm (last visited Apr. 8, 2016); but only for the very limited purpose of determining whether a proposal has met the “resubmission threshold” to qualify for inclusion on the next year’s corporate ballot—a minimum 3 percent, 6 percent, or 10 percent vote, respectively, in successive years. ​See Amendments to Rules on Shareholder Proposals, Exchange Act Release No. 40,018; 63 Fed. Reg. 29,106, 29,108 (May 28, 1998) (codified at 17 C.F.R. pt. 240). Because this is a staff rule not voted on by the commission, because it exists for a limited purpose (with multiple rationales, including reducing workload in processing 14a-8 no-action petitions and adopting a permissive standard for ballot inclusion), and because it contravenes clear and long-standing deference to substantive state law in the field of corporate governance, the notion that this limited SEC staff vote-counting rule should dictate counting methodology, irrespective of state law and governing corporate bylaws, is untenable. See Facilitating Shareholder Director Nominations, SEC Rel. No. 34-62764 (Aug. 25, 2010), available at http://www.sec.gov/rules/final/2010/33-9136.pdf; see also 17 C.F.R. § 240.14a-11 (2011). Business Roundtable v. SEC, 647 F.3d 1144, 1152 (D.C. Cir. 2011). See Abigail Caplovitz Field, Proxy Access Debate Far from Over, CORPORATESECRETARY.COM (Sept. 9, 2011), http://www.corporatesecretary.com/articles/proxy-voting/12000/proxy-access-debate-far-over. New companies were selected based on executive compensation, board diversity, carbon emissions, and the percentage of the New York City pension funds’ portfolio. See Boardroom Accountability Project 2016 Company Focus List, http://comptroller.nyc.gov/boardroom-accountability/2016-focus-boardroom-accountability. The exception is Cummins, which limited the number of shareholders who could aggregate ownership shares to nominate a director to 20 but adopted a proxy-access rule that would allow shareholders to sponsor directors constituting 25 percent of board seats. See press release, supra note 12.